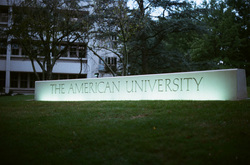 Who is organizing "Think Transatlantic" at AU? The "Pi Chapter" of the professional foreign service Fraternity Delta Phi Epsilon (DPE) is proud to be the lead organizer for the "Think Transatlantic" campaign at American University (AU). Additionally AU's School of International Service (SIS) is supporting the execution of the Campaign in a number of ways, such as helping us organize speakers. To learn more about DPE's Pi Chapter click here. Embassy of the Federal Republic of Germany in Washington, DC. Acting as the public diplomacy department of the Embassy, the GIC frequently hosts campaigns such as this year's Think Transatlantic Campaign. To find out more about previous GIC campaigns, click here.